Los Angeles, CA, May 1, 2014 – It's hard to imagine a two-year-old Theron Feemster (aka Neff-U) at a drum kit, but it's there that the man responsible for some of this century's biggest hip-hop hits started his musical career. Born the son of church ministers in a small town in North Carolina, Theron's musical upbringing was firmly in the realms of religious music, but his approach was anything but ordinary. "I grew up in a very untraditional church. However you felt, that's how you expressed yourself, and whatever I felt musically was how I expressed myself. I think that having that foundation of freedom allowed me to grow in a way to where I wasn't restricted to a certain formula of how to create." 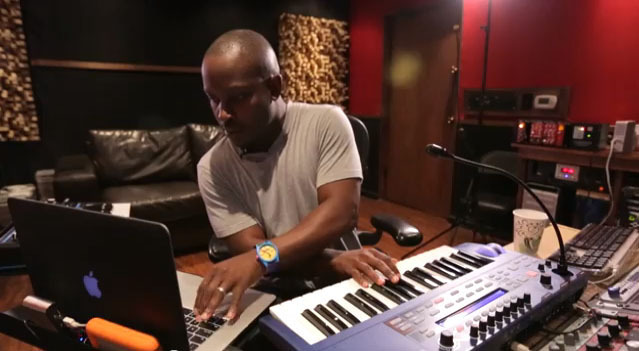 With his roots planted, Theron learned numerous instruments quickly, and by age seven was musical director at the church, a position that saw him in new and unique musical situations on a regular basis. His love for music took him to Berklee College of Music, where his talent didn't go unnoticed. Soon, his friend and guitar player Erick Walls invited him to a production session in California, and before long he was being mentored by legendary rap producer Dr. Dre. In 2002, he co-wrote and played keyboards on four tracks on The Eminem Show, which won Best Rap Album at the 2003 GRAMMY® Awards. Subsequent work with 50 Cent, Ne-Yo, Nelly, Mary J. Blige and countless others cemented his position in the R&B scene. From there, Theron joined the production team for the King of Pop and produced tracks on Michael Jackson's posthumous albums Michael and Immortal. Theron's ability to just sit down and translate whatever he's feeling is enviable. He notes, "When my fingers hit the keys, whatever comes out is what I'm going to keep. And that's fun, it's just being vulnerable to the unknown." But maintaining his skill requires practice. "There's a saying that I've learned that's 'don't expect to get to greatness until you make your gift great.' Through all these years and even today, I'm constantly sharpening my craft, exploring new different sounds that are out there in the world and exploring new different pieces of gear." And the latest new piece of gear for Theron is the Focusrite Red 1 500 microphone preamp. "It's important to have a good preamp, because when you have a good preamp that can translate how you sound, it gives you a sound with integrity." During a tracking session with vocalist Sarah West, Theron fell in love with the sound of the Red 1 500. "It kept her voice warm and crisp, and it gave her clarity." Also during the session, Theron recorded a drum track, to add some natural vibe to his programmed drums. Theron's engineer Bob Horn fed one overhead mic through the Red 1 500 for the recording, and the outcome shocked Theron: "It's expected to be used on vocals, but to actually know that you can use it on the entire drum set, that's incredible. One mic and one preamp gave me such a big, dynamic sound."